My trip to the mysteriously mystical land of Khmer is a trip, of which I remember more than I have seen, and soaked more than my eyes could see. Angkor Thom was apparently the last capital city of Khmer Empire, established by King Jayavarman VII in the late 12th Century. 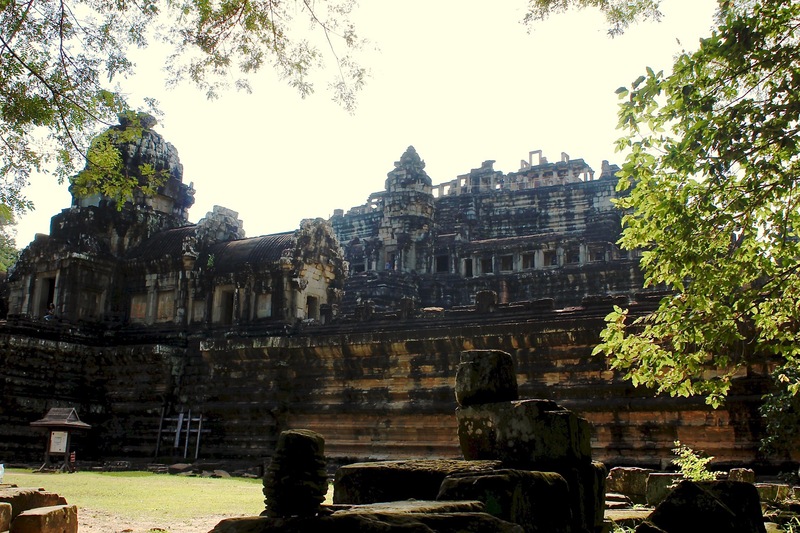 While Angkor Wat is a temple, Angkor Thom is the city, the walled city, built more than 800 years back and home to multiple temples and more than a hundred stone statues. Apparently, Jayavarman VII built this beautiful and magnificent city to commemorate his victory over the Cham in 1181. Those days it surely would have been larger than any European city of its time. 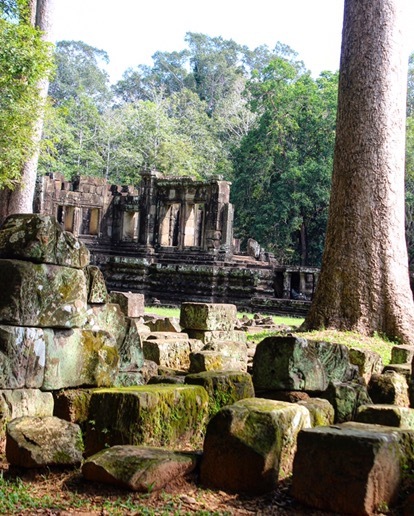 At the centre of Angkor Thom is Prasat Bayon, or the Temple of face towers, the state temple of King Jayavarman VII, built towards the end of 12th Century. Bayon has 54 towers and 216 faces of Avalokiteshvara, also known as the Bodhisattva of Compassion. Closed eyes and a mysterious smile which represent the all-knowing state of inner peace, perhaps the state of Nirvana. 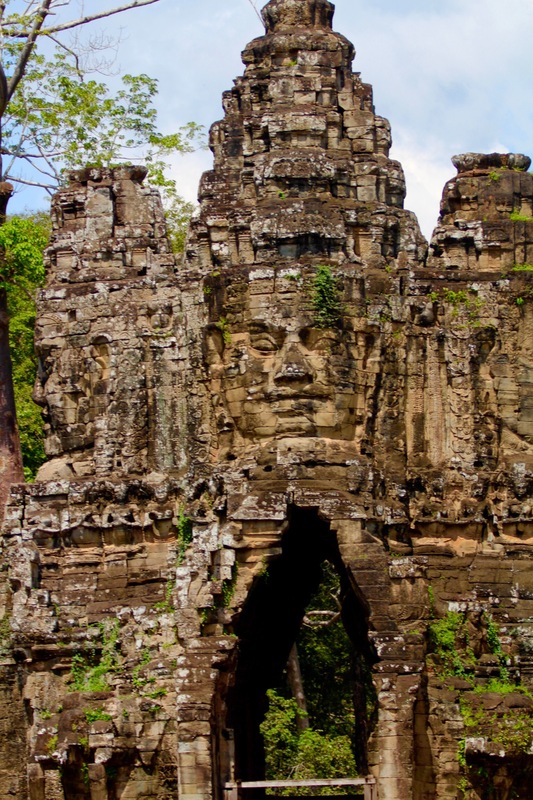 These massive faces make Bayon unique and is often referred as the Monalisa of South east Asia. This temple should be viewed early in the morning just after sunrise, and this time I was perfect with my timing. This is the time when sun shines on the faces and the neatly carved expressions look mesmerising. 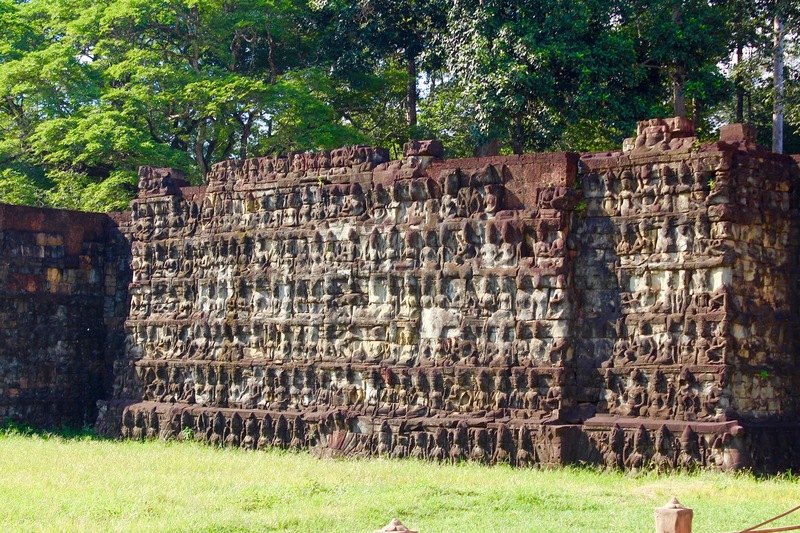 While some scholars believe these faces to be of Bodhisattava, some believe it to depict King Jayavarman, because of the resemblance with other images of the King. It is quite possible that this is how the King who considered himself to be the God-King presented himself with the attributes of Bodhisattva. Walking amongst 216 larger than life carved stone smiling faces is truly an experience of a lifetime. 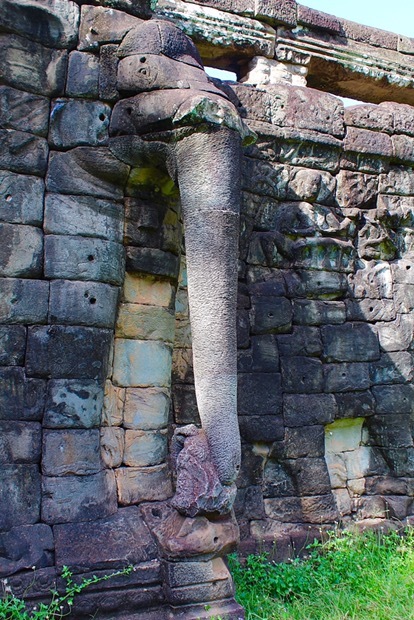 The entrance of Angkor Thom has face towers, and along the towers on both the sides are giant figures carrying Naga- depicting Samudra Manthan. The four faces on the tower stand for the four sublime states of Buddhism – charity, compassion, sympathy, and equanimity. There are 54 towers and these towers represent the 54 days of the lunar calendar, and the 54 provinces of the Khmer Empire of King Jayavarman VII. The giant figures on either side of the path were by far my favourite as each had a different expression. There was something intriguing about these giant statues with their expressive faces. These statues represent Asuras on one side and Gods on the other side, holding the giant serpent, depicting Samudra Manthan. Another important feature of Bayon temple is, how Khmers made their transition from Hinduism to Buddhism and again back to Hinduism for a brief period, before finally going back to Buddhism. This religious tug of war resulted in removal of faces of many religious figures and destruction of many stone idols. Today we find evidence of both Hinduism and Buddhism present on the walls and stone figures. 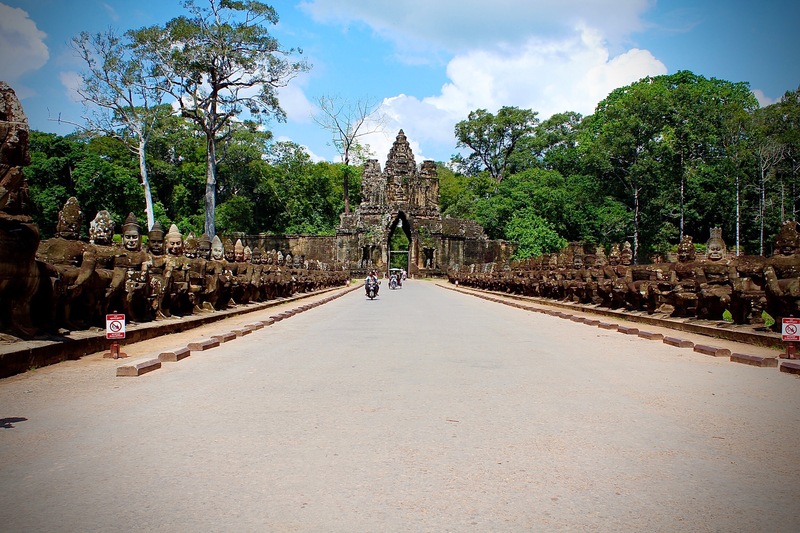 Angkor Thom is a walled complex with many temples and architectural marvels of Khmer kingdom. After Bayon I walked towards Terrace of The Elephants. 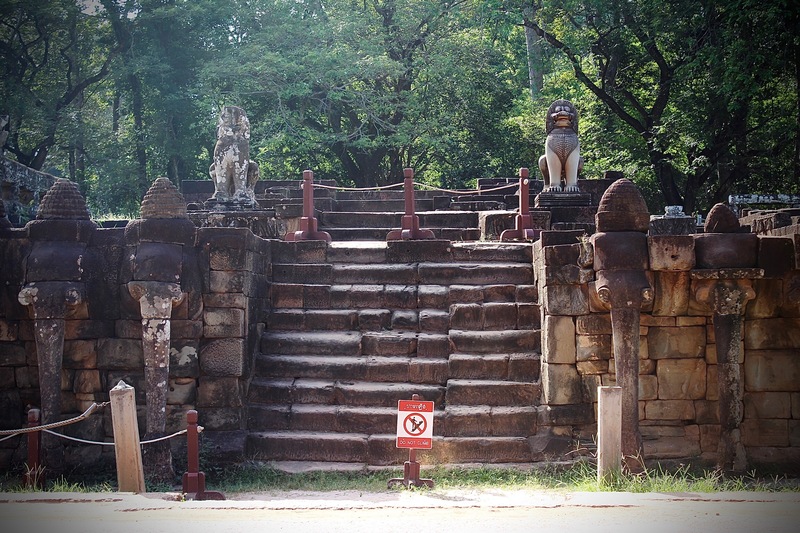 This terrace was used by King Jayavarman VII to receive his victorious army and it extends from the palace of Phimeanakas which today stands completely ruined. 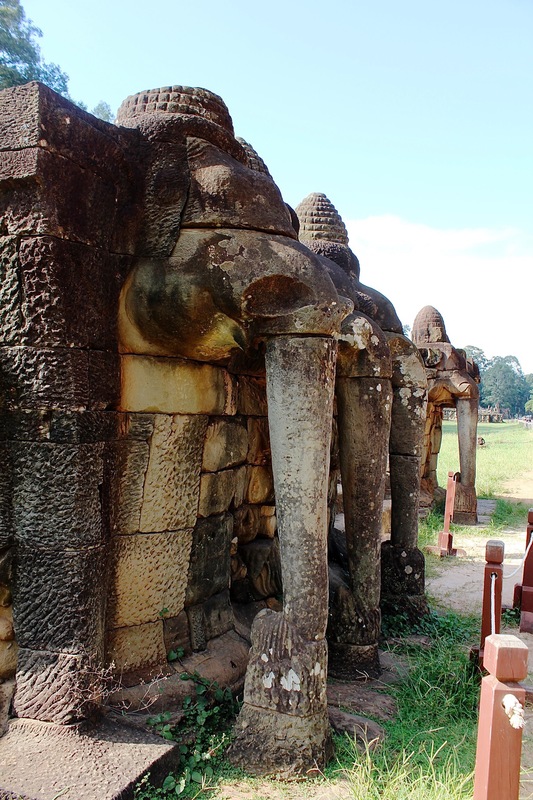 The 350 meters long terrace is decorated with carvings and statues of life size Garuda, lions and parade of elephants. This terrace also served as a podium from where the king would observe dances and various other ceremonies. On the north of the terrace of elephants is the terrace of the leper king. It got its name from the 15th Century statue discovered here, discoloured and covered in moss. Legend says King Yashovarman-I had leprosy and this statue somehow fit the narrative. But some historians believe it to be statue of Hindu god Yama, the god of death. The carved walls have apsaras, the king and princesses. 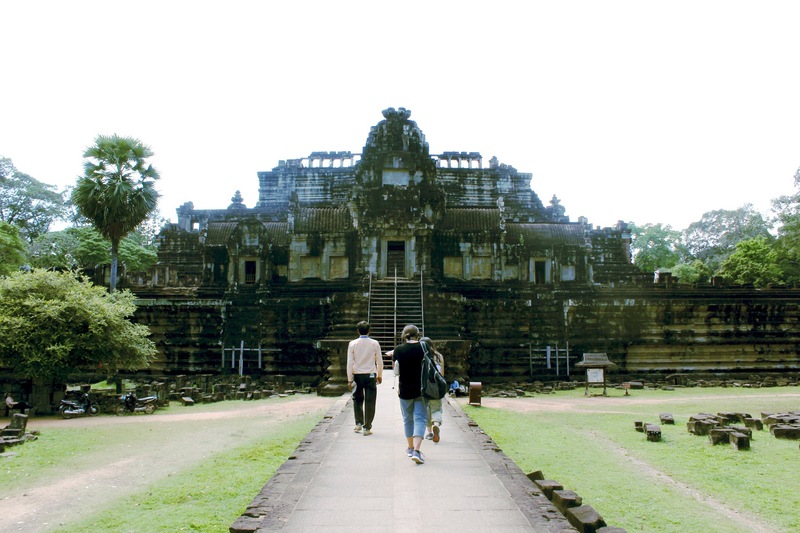 In the centre of the walled complex stands the Phimeanakas, the royal palace, of which very little is left today. On the north east of Bayon stands Baphuon. It was built in the mid 11th Century as the state temple of Udayadityavarman-II. Archelogists call it worlds biggest jigsaw puzzle, as it was a 300,000 stone pieces that had to be put together and make the structure stand again, after it was totally razed down during civil war. It took 51 years to restore this temple, and restoration completed in the year 2011. 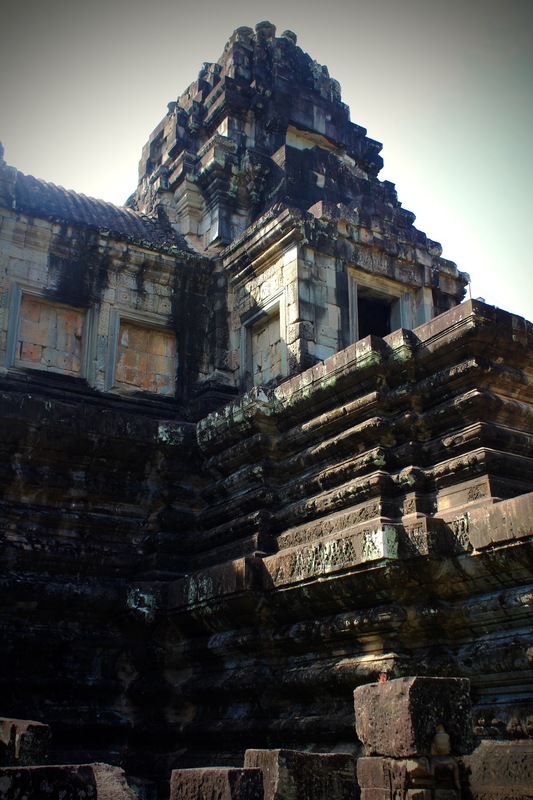 The pyramidal structure of Baphuon represents Mount Meru, just like Angkor Wat temple. 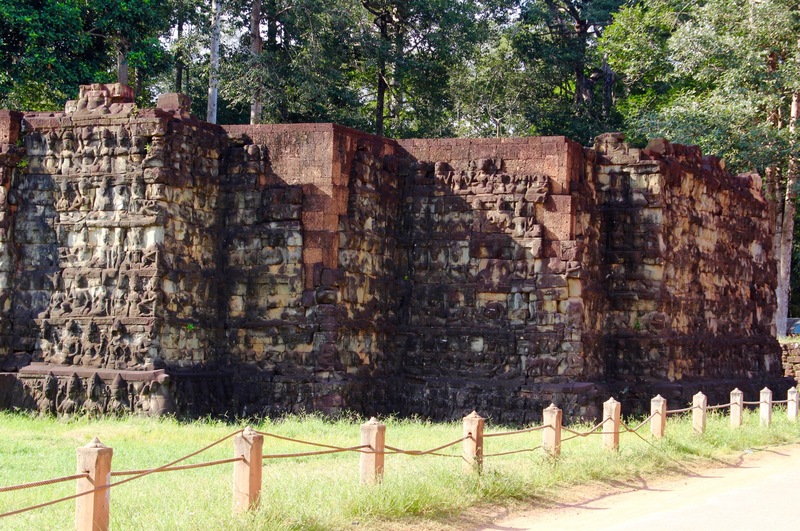 To the east of the terraces are the 12 towers of Prasat Suor Prat. The name means towers of the rope dancers. The exact utility of these towers are still unknown though various travellers and historians have given their own version, from a place to settle disputes to shrines to being honour guard along the central square. 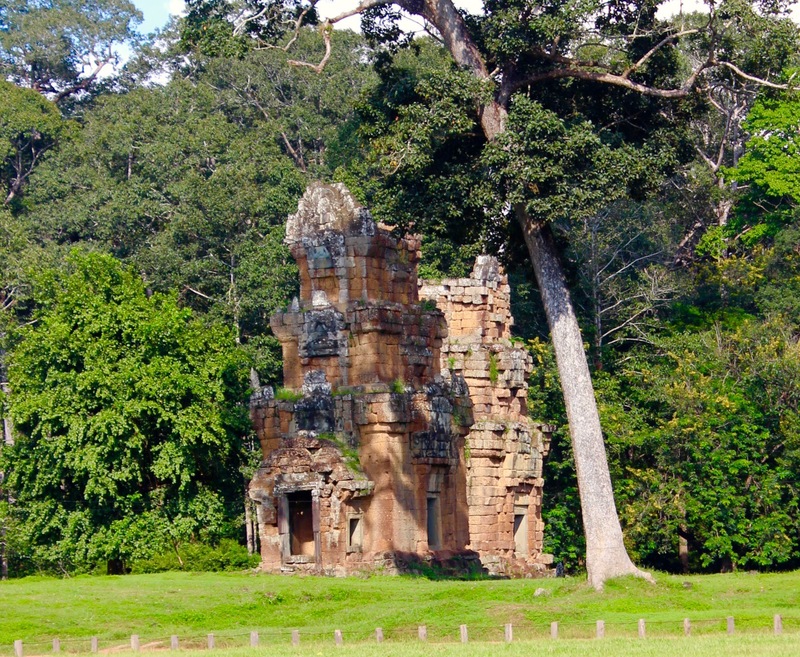 Little further towards north west of Phimeanakas is Preah Palilay, built towards the middle of 12th Century by Jayavarman VII. 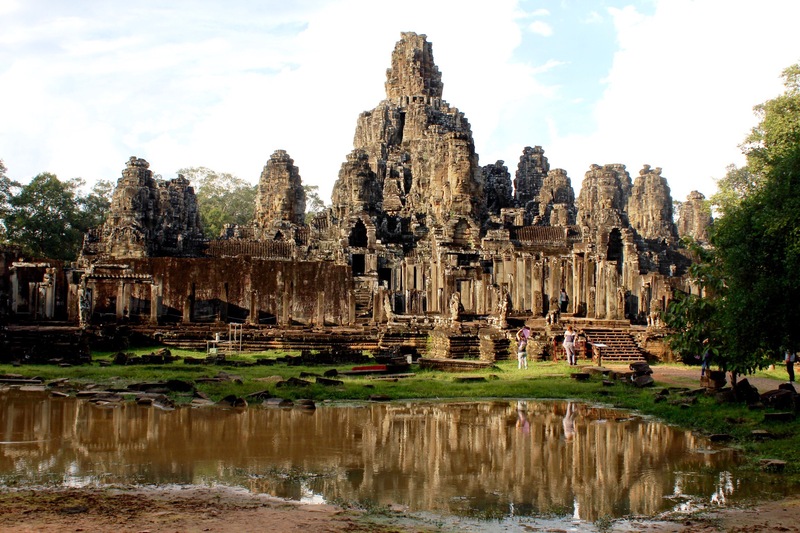 Angkor Thom is pretty widespread and needs a lot of walking, hence make sure you wear comfortable shoes, and I can assure you, every pain is worth it. … This journey shall continue, as there’s still a lot to explore and learn.